‘Joint Effort’ is a series of spatial investigations which work in three distinguishable systems. The first system is how they are created — within a meticulously planned selection of materials such as marble slabs, glass or mirror panels, stones, concrete or granite forms, I-beams, bolts, and ratchet straps. 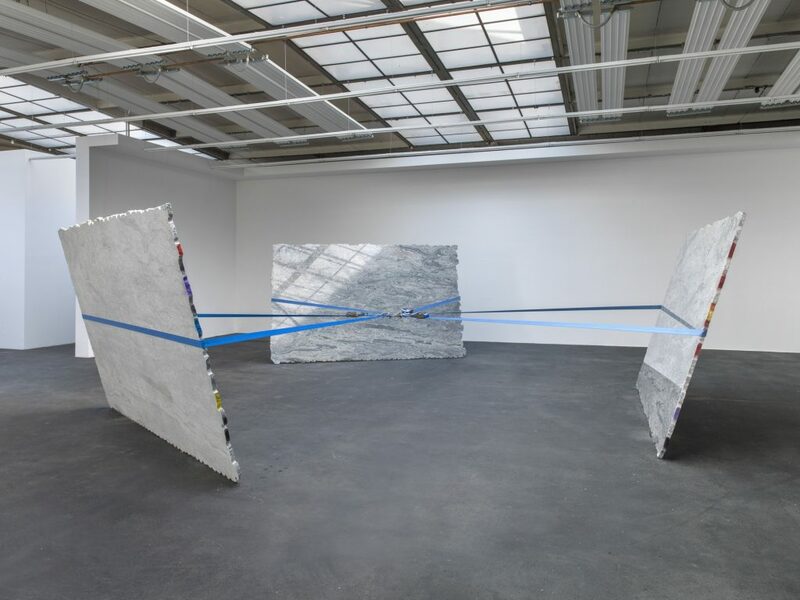 The second system has to do with variables which are external to the materials; this is the correlational equilibrium that the artist determines for each sculpture, a physical interaction that weight cancels out pull, and pull cancels out immobility. Within this system, inside this play, the elements in the work are composed and balanced. The third and more complicated system is abstract and sometimes obscure. 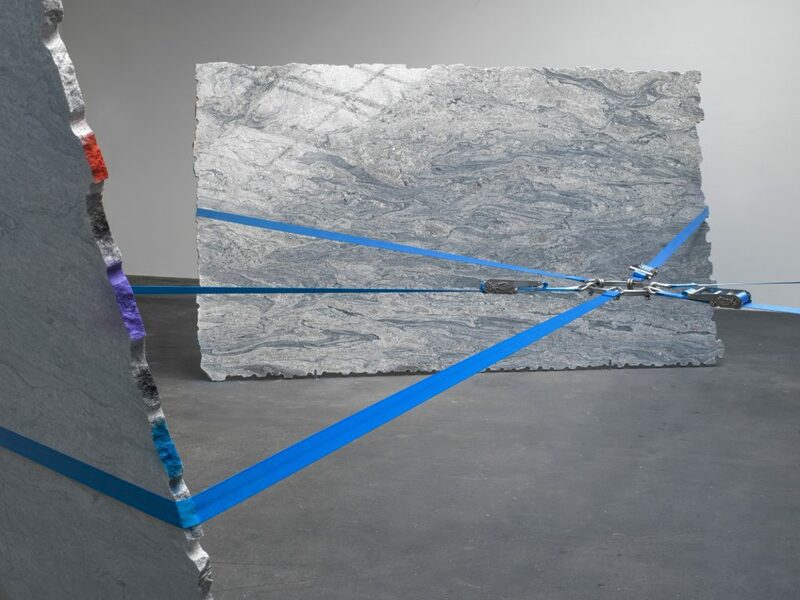 It comprises the symbolic nature of materials and the conceptual relations that emerge from their juxtaposition: volcanic rocks resulting from lava explosions and subsequent eons of cooling; Brazilian marble slabs coded with exuberant patterns, which are literal slices of mountains destined to be fancy kitchen countertops—a fate that Dávila’s interventions prevent; mirrors reflecting the tension of industrial straps made out of synthetic fibers capable of resisting the pull of merchandise traveling to the most unnavigable regions. The title ‘Joint Effort’, which names most of the sculptures in this series, is also part of this last conceptual system, suggesting some sort of productivity or collaborative work with a moment of communal intentionality leading to a tangible result. Oddly, that result is a state of repose, a cancellation of forces that leads nowhere in the labor sense that the title suggests, only to an aestheticized moment of equilibrium, a turmoil of cancelling forces in which objects cease to exist as independent entities for becoming a collective event. 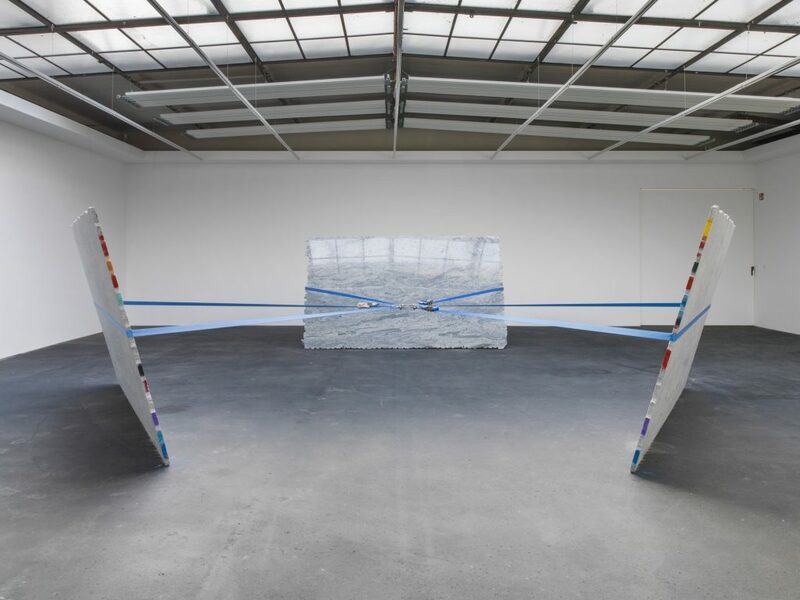 For his first exhibition at KÖNIG GALERIE in Berlin, Dávila has created a site-specific sculpture that reacts directly to the space. This strategy has recently been used by the artist as a way of incorporating the particularities of a space into the dynamics of sculpture. Though the installation is titled ‘The Stone that the Builder Refused’, it is formally related and belongs to the ‘Joint Effort’ series. 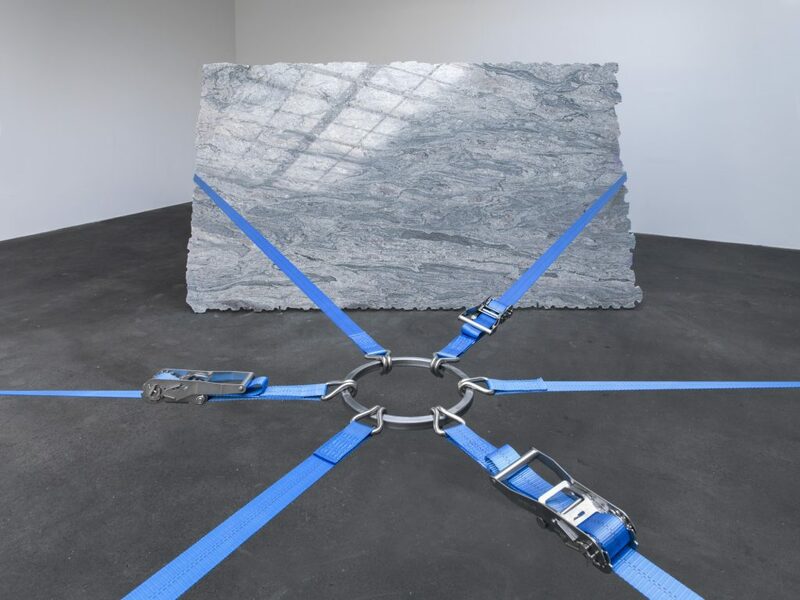 It includes three large rectangular granite slabs, leaning towards the viewer and supported by blue ratchet straps conjoined by a central metal ring. 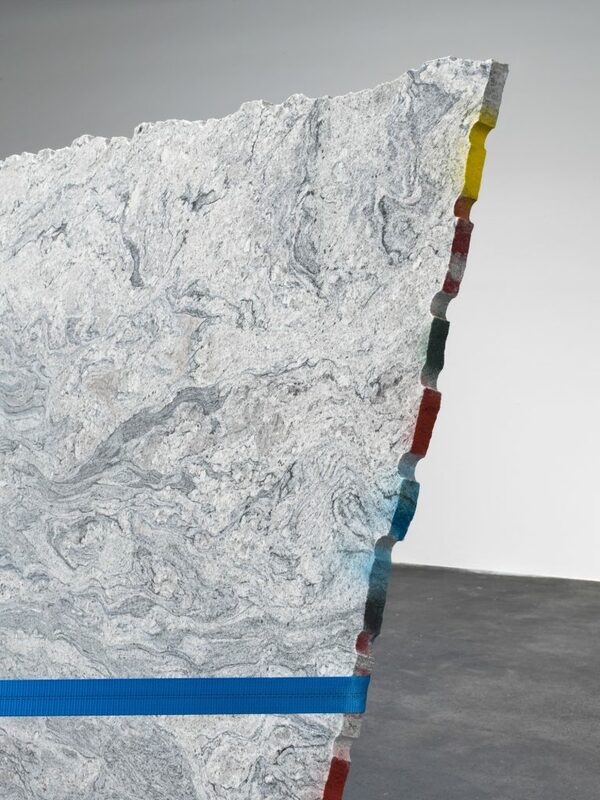 The title of the piece alludes to one of the New Testament’s most repeated phrases, ‘The stone that the builder rejected has become the capstone’. Aside from the moral and spiritual implications of this phrase, what becomes more relevant to Dávila are the layers of mediation that the phrase has undergone over time. Centuries later it was taken by Bob Marley, who took liberties in generating his own particular version of the verse. This process of appropriating an element that is culturally relevant or that has somehow become iconic, and furthermore of subverting the deepest roots of its importance through strategic substitutions of materials, is perhaps Dávila’s most significant mode of operation. As Jorge Luis Borges said, every translation creates a new thing. For ‘The Stone that the Builder Refused’, Dávila has decided to play with the idea that the central piece holding this sculptural form — what we might call the capstone — is a metal ring. Unlike the perfection and strength that a capstone should possess, the ring instead offers a universal form which is empty inside, but still holds all the forces together. Jose Dávila ‘The Stone that the builder refused’, exhibition view at König Galerie, Dessauerstrasse, Berlin.